Christmas is just around the corner. You wish to be with him this season and that's one of the best gifts you could ever have. Feels like this occasion doesn't mean anything without the man who makes it complete. It's different when he's around you and sharing what you've got for each other. All you really want is to spend the holidays and make the most out of it as you really don't have so much time the past few months. You've been waiting all year and you are really excited for what's up this time. "Love is such a wonderful feeling. with the one you love makes it even more exciting. Baby thank you for being such an angel in my life. I love you so much. Merry Christmas." 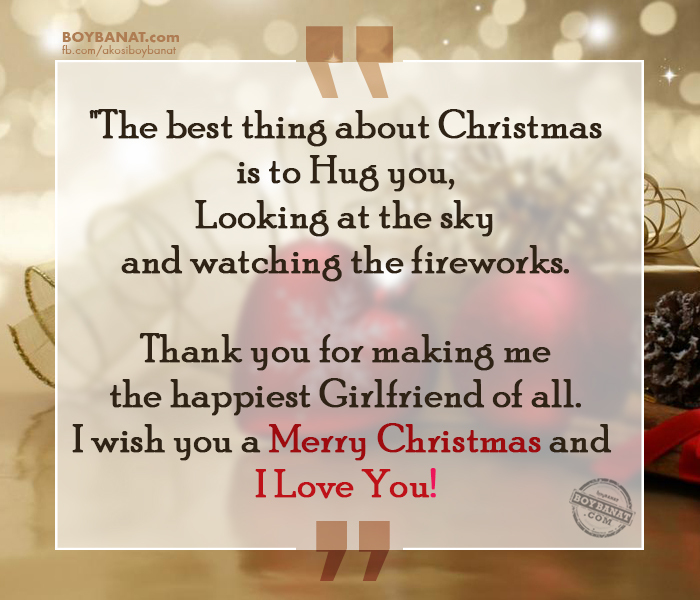 "All my love for you will be my Christmas gift. together at midnight tonight. Merry Christmas!" I want to live all the Christmas' of my life with you baby. "I do not want you to get me any presents. I only want to have you with me and I will be very happy. Your presence is enough to have a Merry Christmas! "No Christmas gift is greater than the gift of love. Thank you for giving the best gift ever. "Before I met you, all days were the same for me. and show you how much I love you. Merry Christmas!" my baby in my arms! I love you sweets. Merry Christmas to you!" beneath the tree can match in worth. Thank you and Merry Christmas Hon! looking at the sky and watching the fireworks. Thank you for making me the happiest girlfriend of all. I wish you a Merry Christmas and I Love You!" "All I want for Christmas is you, so don’t worry about my gift. Letting me be yours is the best gift anyone could ask for. Merry Christmas. I love you Hon! What are you preparing this year for your boyfriend? Remember to give from the heart. If you also have your own Christmas Quotes, feel free to share them with us. We will be delighted to have them featured here at www.boybanat.com. Let us inspire more readers. For more reads and updates, you can also visit Boy Banat Official Facebook Page. Warm regards.